I just had a cup of green tea that I'd like to share with you. I work in a library, which some of you may know, and one of my library patrons gave me a little gift-- a packet with two odd-looking sort of straw balls in it it, labelled "Flower Among the Tea". 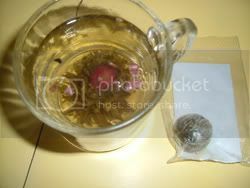 She told me that when you steeped it the ball turned into a beautiful flower in a cup of green tea. And indeed it did! Lisa got it from the Tea Centre in Courtenay, BC, near where I live. Check out their page about "Flower Among the Tea". It explains how they make them, too. (They mail-order.) I recommend using a glass cup, as I did, for full effect. 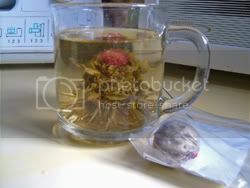 (Or a glass "flowering tea" pot for larger tea balls.) They say you can steep it three times. UPDATE: There are now many brands of flowering teas available, including on amazon. An organic brand is Numi. Just thought it was too interesting not to share (and it tasted good too!). Ha! What a coincidence, Bryanna! That is exactly what I was referring to on your forum. I love these. They are handmade and have such great flavor. The Numi brand I get can be steeped up to three times; but I find I can do a fourth! Delicious and beautiful. 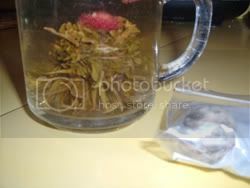 I googled "display tea" and came up with lots of hits-- who knew? Or, for a small group, use a glas teapot, perhaps? My fiance works with this Greek couple who went to China and brought back some of these. They were kind enough to give us a few of them and I still haven't used them. I LOVE tea and I have just been waiting for the right occasion! I even got a glass teapot for when the time is right! You can find this tea at Teavanna and Taylor also cites Nume as having flowering teas.